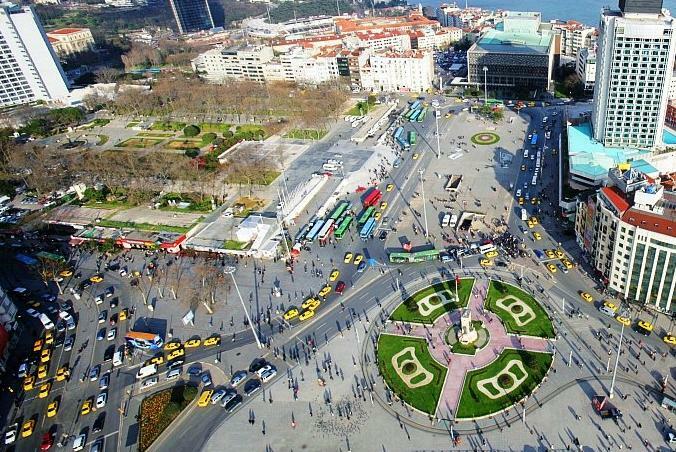 Streets become highways, trees make way for the mall in a new plan for Taksim Square in Istanbul. Today, Istanbul’s Taksim Square is a bustling hub of activity, with majestic Gezi Park providing some natural solace — even when the trees are brown in winter, as in the above photo. But a new plan would eliminate most of the greenery in this photo and cut off Taksim from the rest of the city. That’s the argument of the Taksim Platform, a group of concerned citizens, urban planners, lawyers, and academics who have so far collected more than 13,500 signatures against the project. See what the new square would look like after the jump.